Leah Malia Kammrmann was born in Drohobycz on October 22, 1862. About 1890, she married Chaim Luzer Koppel. Chaim died in Drohobycz in 1921. Leah Malia sold vegetables and other food in the Drohobycz market square to support her two sons, Joe and Ben. 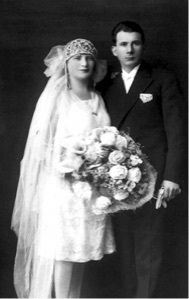 The wedding photo of Esther Hinde Kamerman and Henoch Schwarz was taken around 1925. Esther Hinde was born in Drohobycz in 1901 and died in Israel in 1978. In the early 1930’s, her mother Leah Malia accompanied her daughter Esther Hinde and son-in-law Henoch Schwarz to Palestine, where she died. Left: Bernard (Berl) Kammerman, Joe Kamerman’s brother, was born in Drohobycz, April 25, 1893. He served in the Austrian Army and was captured by the Russians very early in World War I, around late 1914. After he was released, he travelled through Russia and the Middle East before returning home to Drohobycz around 1920. It was in this year that this photograph was taken, before he left for the USA in 1921. He died in the Bronx, N.Y. in 1976. 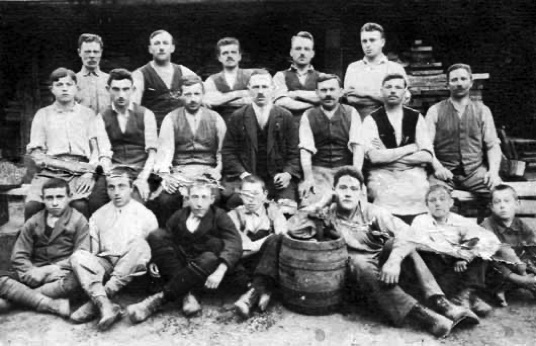 Above: This photograph taken in 1921 is of the employees of a carpentry workshop. They were probably making furniture. Twenty-two-year-old Joe Kamerman, wearing a white shirt and no vest, is standing at the extreme right in the top row. Joe Kamerman had started as a carpenter’s apprentice in a different shop when he was twelve. The boys seated at the bottom are apprentices. Lerner cousins and later moved to Brooklyn where in 1929, he married Lola Tuchfeld, who had come from Stryj. He died in Brooklyn, NY, 1993. 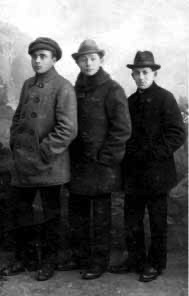 A photograph of Joe Kamerman and his two friends taken in Drohobycz about 1920, after Joe had finished his service in the Austrian army and before he emigrated, Joe is wearing a coat that Abe made for him out of a blanket. Abe Gotthofer, born in Drohobycz around 1897 and died in Queens, N.Y. 1986, came to the USA about 1926. Willie Wagner was born March 10, 1897 in Drohobycz and died in Brooklyn in 1991. He came to the USA about 1921. Left: This montage of eleven individual photos constitutes the committee that arranged the celebration of the 20th Anniversary of the Independent Drohobycz Young Men's Sick and Benevolent Association founded in New York in 1904 (not on the 15th as the photo states). Along with Joe Kamerman and Bernard Kammerman is their first cousin Max Lerner (ca 1892-1951) and Hyman Turenshine (1883-1945), the husband of his first cousin, Kale Lerner. Joe’s friend, Willie Wagner, and his brother Abe are also in the photograph. All these men were born and grew up in Drohobycz before coming to New York. These photos are published here courtesy of Joe Kamerman’s daughter, Sybil Jacobson and his grandchildren, Leslie and Mark Jacobson.